Fishermen are always trying to adapt nets to the circumstances they fish in. The introduction of the discardban will undoubtedly be one of these circumstances. Nets in general take advantage of the escape behaviour of fish. That is why a 20cm herring can be caught in a net that has meshes of several meters in the mouth. By increasing the mesh size of the cod-end, smaller fish can escape. Or bigger fish can be guided out of the net by placing a panel or grid in the tunnel. So when designing a net that lets certain species escape and catches others, the designer can focus on mesh size and escape behaviour. When testing selectivity measures in the net, we have to be sure the entire school entered the net. If not, the part of the school that was lost could be the bycatch you where trying to select. A clean catch could then be mistaken for a successful separation. 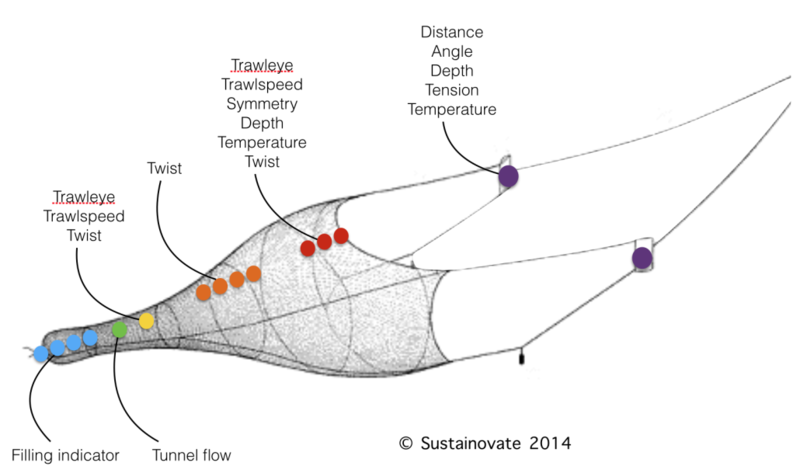 Understanding the behaviour of the fish in the trawl gives possibilities to influence this behaviour and use it to develop new types of smart nets that are more selective for the target species. Relatively low quota species will be a limiting factor (the so-called ‘choke’ species) where unintended bycatch of this species by pelagic vessels may result in a premature closure of the entire demersal mixed fishery, jeopardising many commercial fisheries in the region. A second opportunity for smart fishing gear is for the gear to be able to select size of fish. The bigger fish can be sold for human consumption, everything below a minimum size can’t. This means there is a very high potential return for a net that I smart enough to be able to filter out the bigger fish and release the small sizes. A third opportunity arrises with unwanted species that are difficult to process onboard such as boarfish. Boarfish can cause major handling problems. Because of the coarse structure of the fish, with a spiny back, it is very difficult to process boarfish in plate freezers. That is the reason Boarfish is being discarded by freezer trawlers. The discard ban will therefore be a major problem for vessels targeting horse-mackerel for human consumption if they cannot avoid boarfish bycatch. Smart fishing gear is a possibility for this.